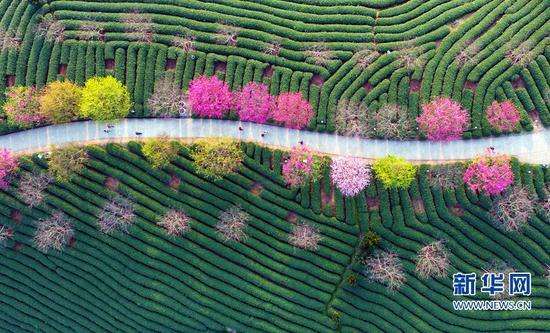 Longyan city, in Fujian province of southeastern China, is set to hold its first culture and tourism industry development conference in Gutian of Shanghang County from April 29 to May 4, with the aim of boosting the local tourism industry. A prefecture-level city with seven counties and areas, Longyan is well-known for its picturesque landscape of green mountains and crystal-clear waters, with forest coverage up to 77.9 percent. It boasts a diversity of traditions and cultures and is famous as the "Home of the Hakka People," who account for 75 percent of Longyan's population. A UNESCO World Heritage Site in Longyan, the tulou, which are large, fortified earth dwellings unique to the Hakka of Longyan, are acclaimed as an exceptional type of oriental building complex and attract throngs of tourists each year. In addition to Longyan's Hakka culture and a sound economy, the city's first cultural tourism industry conference will highlight its "red tourism," said He Minghua, Longyan's deputy Party secretary, at a press briefing in Beijing yesterday. Red tourism focuses on historical sites that record China's Communist revolution between 1921 and 1949. He said the conference venue of Gutian is a historic site that has witnessed an epoch-making history of China's ruling Communist Party of China. Through the conference and various tourism promotions, Longyan is boosting efforts to become better-known and to explore opportunities for sustainable tourism development, said He. Twelve programs will be presented during the conference, including contests on the Douyin video platform, a cultural tourism forum, a week-long performance of cultural heritage and folk customs, a photography competition and a gourmet cuisine festival, said Shanghang County Head Wang Bo, who is responsible for the conference preparatory work, at the press conference in Beijing. Three Olympic champions from Longyan, including trampoline gymnast He Wenna, and weightlifters Shi Zhiyong and Zhang Xiangxiang, attended yesterday's conference. Two-time Olympic badminton champion Lin Dan also transmitted his best wishes to his hometown through video message. Longyan city, in southeast China's Fujian province, will hold its first culture and tourism industry development conference in Gutian, of Shanghang County, with the aim of boosting the local tourism industry.